If it’s just too darn hot, don’t keep everyone cooped up inside; invest in the resources your family needs to enjoy a day in the sun, all in the comfort of your own yard. Water and sand tables are the answer for families looking for splashy ways to spend their summer days, without having to commute or spend the time and money on a personal pool. These tables usually feature accessories that encourage children’s developmental progress, enhancing their motor skills, hand-eye coordination, and creative role-playing. All you need is a space big enough to fit a normal table, and voila: you’ve got yourself a mini water park. Make a splash together this year with our Top 10 Water and Sand Tables. Playing with water and sand is so entertaining. Kids just love it. So, giving them a place that is just for that is amazing them. We have created this list with the best water and sand tables. The list has been reviewed and updated with the current tables available on the market. Plus each criteria section has been updated. If you’re going to go chasing waterfalls, it might as well be the ones pouring in the Step2 Rainshowers Splash Pond. This water table features a large pail that allows kids to scoop water from the pond up into the waterfall tray, and watch it fall. The maze pieces are easy to rearrange, making it possible to create new waterfall patterns time and time again. The rain-shower effect comes equipped with a realistic rainfall sound, and the springboard allows you to flip figures backward into the pond water. Awarded by TTPM as one of the Most Wanted 2017 Summer Toys, this water table includes a 13-piece accessory set, a draining plug for easy cleanup, and three water-squirting toys. What a blast! 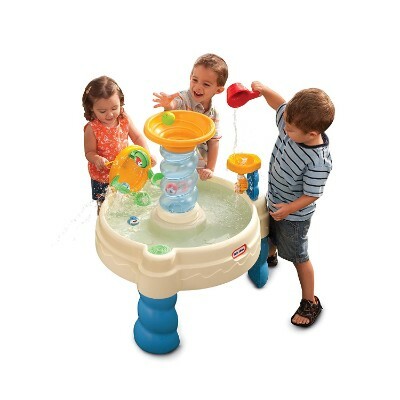 This water table gets kids engaged in fun, splashy, creative play. The rebuildable waterfall is an especially nice touch, as it allows children to explore cause and effect more thoroughly, and work through some logic and problem-solving skills. There are tons of little features that make this water table special. The rainwater is aesthetically beautiful and leaves kids in awe. The waterfall puzzle-pieces allow them to rebuild the path that their water is running. The springboard gives the water-squirting toys just a little more pizzazz; it’s interesting and multi-faceted enough to keep little ones engaged when their attention spans might usually wane. As its name implies, the Big Splash Waterpark is Step2’s perfect water table for kids. 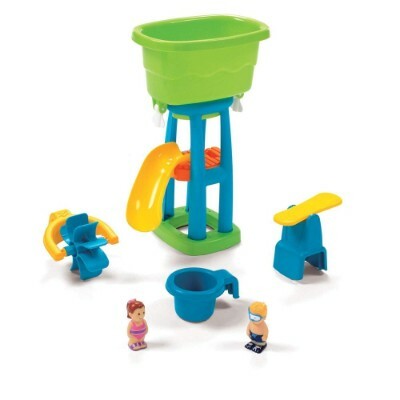 This 31.5-inch diameter play set comes with a 4-legged tower with a huge bucket on top. The tower has several slots upon which your child can place a waterwheel and a curved slide. Liquid from the bucket pours into both the waterwheel and the slide attachment to spin the wheel and create a waterslide, respectively. 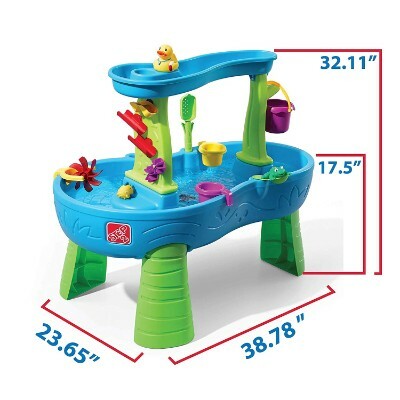 Your child can also attach a beautifully designed diving platform on the side of the Big Splash Waterpark to help catapult any one of 2 water table toy figurines. 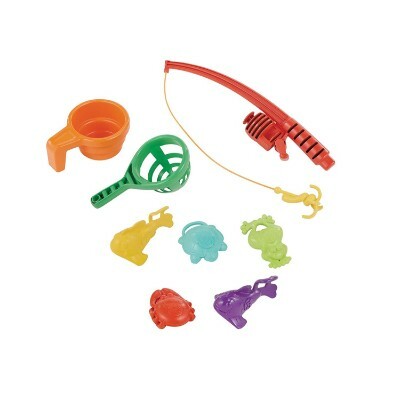 Both the boy and girl figures come complete with their swim attire including goggles and snorkel for the boy figure. The Big Splash Waterpark has an easily accessible drain plug so that cleaning is made a lot easier. This toy can bring endless hours of backyard fun! With several tower slots and the water wheel, there’s a ton of options that a child can get creative with. The diving platform alone leaves loads to the imagination. In between those playful moments in the kiddie pool, they can just take a break with this water table. The easily accessible plug for clean-up is a parent’s dream. This water table comes with a ton of different elements, and it’ll keep your kids busy those hot summer days for hours on end. Between tower slots, a water wheel, and all the water-themed attire this table comes with, it’s sure to be a blast that your child won’t soon outgrow. 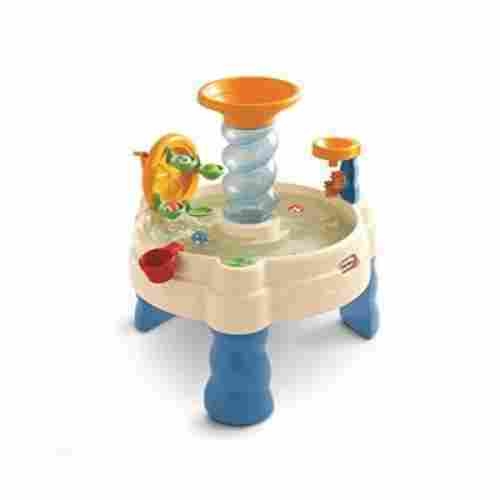 Parents consider the Spiralin’ Seas Waterpark Play Table as one really fabulous looking water table for kids. Designed by renowned toy maker Little Tikes, the Spiralin’ Seas is a fun-filled waterpark on a small 29-inch diameter table. Toddlers and preschoolers will have a fantastic time playing with at least three waterpark-inspired activity attachments. The center tower has funnel at the top and down a spiraling waterway. Kids will have hours upon hours pouring liquid into the funnel or dropping colorful plastic balls that gets flushed in the downward roundabout. Watching the balls spiral down the cylindrical waterway will mesmerize children as to how balls can go that fast. There’s a liquid scooper attachment, too, or as Little Tikes put it, a mini Ferris wheel. At the back of the wheel is a lever which kids will have to turn to scoop liquid or even the balls that are floating after having spiraled down the tube. It’s all about control and timing as kids will have to perfectly time the turning of the wheel to scoop the balls. There’s a waterwheel as well. Directly above the two waterwheels is an orange funnel which kids have to pour liquid into. The liquid drains on the topmost waterwheel turning it counterclockwise with a counter rotation on the lower waterwheel. The Spiralin’ Seas can hold a maximum of 7 gallons and already comes with 5 character balls that can also double as squirt balls. 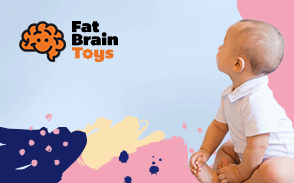 Parents will love this is an educational tool for their children’s motor-neural function and hand-eye coordination development! The control and timing that is required to scoop balls from the waterwheel, is a practical and fundamental to achieve this cognitive end while keeping it fun! With five balls and a capacity for seven gallons of water, this is an item that keeps on giving! The 3 activity attachments on the Spiralin’ Seas can be wonderful instruments to encourage toddlers’ and preschoolers’imagination. Cranking the mini Ferris wheel can also enhance their motor skills. Pouring liquid on the funnel helps in hand eye coordination. If you’re looking for a fantastic sand table with lid then you have to buy the Naturally Playful Sand Table. 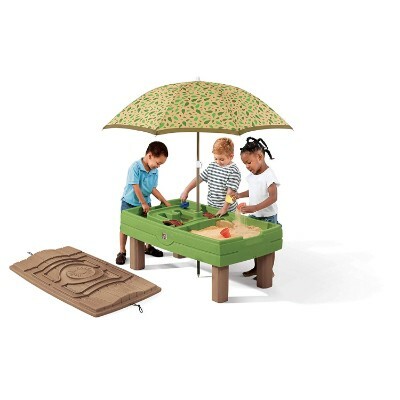 With a 40-lb capacity, this beautiful 36 x 26 inch sand pit table can also double as a Step 2 water table since it has an ingenious solid construction. The lid is styled as a wooden platform which has several wide grooves – molded-in roadways – to accommodate your kid’s small toy vehicles from either Matchbox or HotWheels. 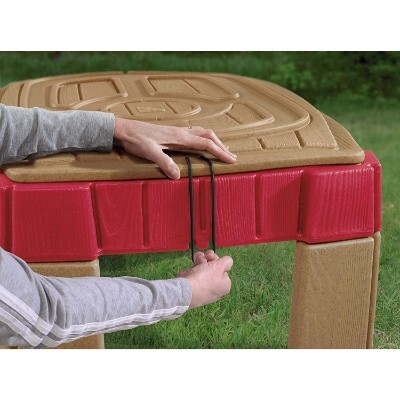 The point is that, your kid will not only be using the sand pit as a play area; he or she can also use the lid as a wide playing surface perfect for putting and arranging your kid’s favorite toys. The Naturally Playful comes with highly elastic tie-downs to secure the lid and keep the sand free of debris and super dry. To complete your kid’s playtime adventures, the Naturally Playful also comes with a bucket, 2 claw rakes, a 2 shovels to give your child a beach-like experience or whatever he or she would like to imagine. This product definitely lives up to it’s name! Naturally playful gives the utter simplicity that a child needs in a complicated world! With the use of imagination without all the accessories, the sand pit can easily transform into a vast desert in your child’s imagination. Or the dunes overlooking a cast sea. Parents will love that they can invest in the little things in life like this. Not just with the design of the pit itself, but the secured lid keeps as potentially no mess and no fuss! The sturdy construction of the Naturally Playful is notable. The multifunctionality of the lid is also noteworthy. 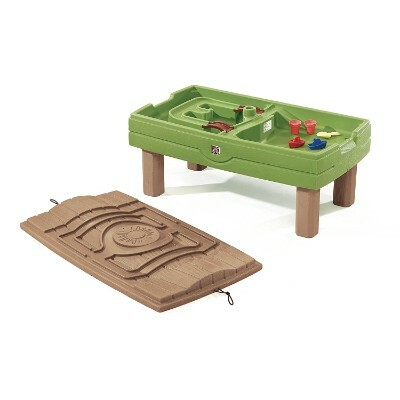 Your kid can play with this table in 3 different ways – as a waterpark, a sand pit table, and an elevated play area. Need something to put your kid’s favorite water table toy on? 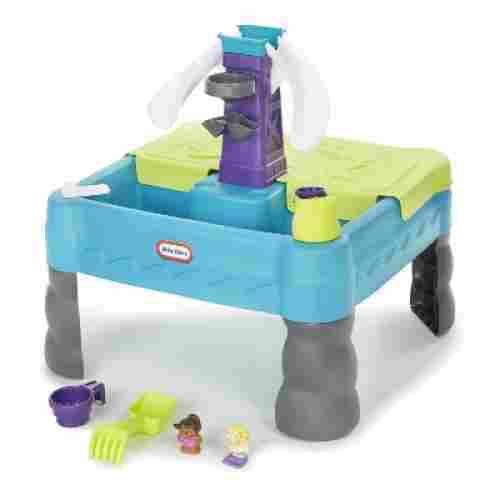 How about the WaterWheel Activity Play Table? This Step 2 water table is a favorite among older babies who have already learned to stand and walk; although Step2 says the product should be used by toddlers. 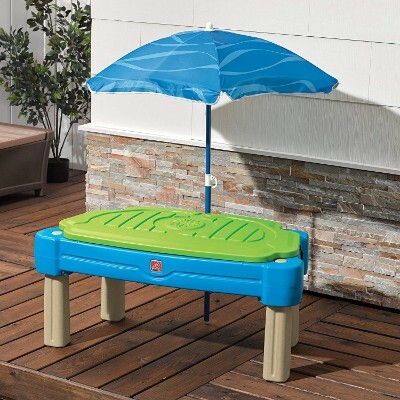 It has an elevated platform to keep your toddler’s feet dry and clean so there’s no need to worry. The WaterWheel has molded-in sections on its water compartment to simulate the deep ocean, the shallow canal, medium-depth lakes, and even a really shallow moat – perfect for stimulating your toddler’s fantastic imagination. It has a tower accessory with a built-in waterwheel in the center. Atop the tower is a funnel that kids will pour liquid into using the accompanying scoop. The WaterWheel also feature molded designs surrounding the platform and on the 3 legs that provide support. 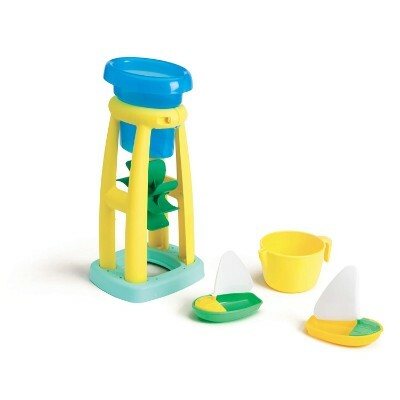 Aside from the scoop or cup and the tower, the WaterWheel also comes with 2 plastic sailboats to help boost imaginative play among young children. This product has an elevated platform that can easily double in the aiding of children just learning walk! They can lean on and into it for all the water exploration they desire! That’s only one function, while the other is to keep feet dry after endless moments of play. The waterwheel, tower accessory, and plastic sailboats, all simulate the imaginative oceanfaring experience. The variable depths of the molded-in sections is perfect in aiding the imagination of children. They can pretend the sailboats are anchoring at the harbor or even sailing out to the deep ocean. Pouring water into the funnel can also help strengthen those small muscles of children. How do you enhance the imaginative play of kids having fun in their very own water table for kids? Do you think an outdoor water table that is designed or styled like a mighty pirate ship will help? 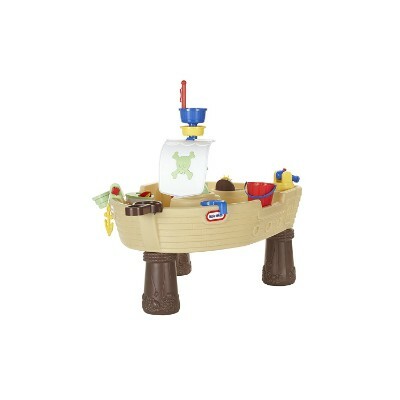 If that’s the case, then you need to buy Little Tikes’ fabulous Anchors Away Pirate Ship. This is one sure hit among kids especially those who are fans of Jake and the Never Land Pirates as well as other pirate characters for kids. 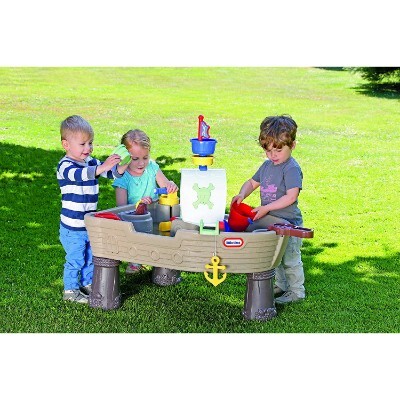 The Anchors Away is a great outdoor water table complete with some of the more common features of a real pirate ship including a center mast complete with a crow’s nest with a colorful skull and crossbone pirate flag. The crow’s nest serves as a funnel to allow liquid to flow onto the spinners on the lower section of the mast. 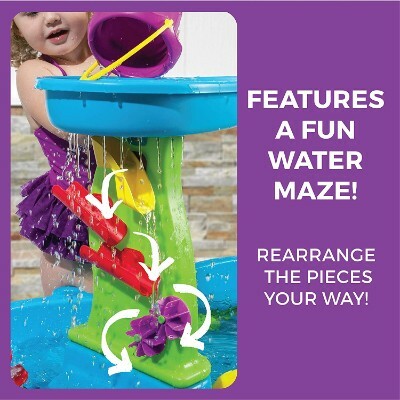 Kids can either pour liquid onto the crow’s nest or even attach a garden hose to a dedicated port and create a beautiful pirate ship center mast fountain for continuous watery fun. There’s a cannon that squirts, a fully turning helm, and an anchor that can be easily lowered and raised by cranking a lever. 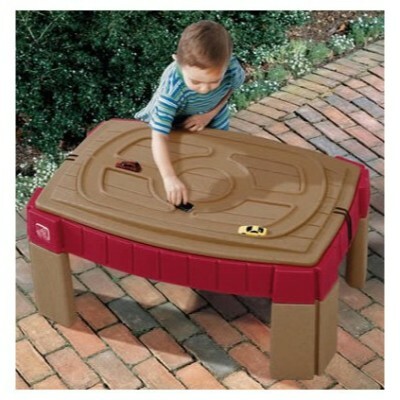 This unique water table for kids also comes with a set of water table toy figures – a pirate captain and a ship’s mate. It also included a blue-and-white squirting shark, a green-and-white boat, a white-and-red floatation device, 2 water cups or scoops, and a bucket. This is probably the second best thing to taking your kids to a Pirates of the Carribean theme ride….also, about half the cost! In addition, endless amounts in your own backyard to save you the trip! Included is an authentic Pirate Ship, with Skull & Crossbones flag. The doubling crow’s nest that acts as a funnel, can easily be fitted with the garden hose for an endless fountain effect. A squirting cannon, turning helm, and functional anchor, make this the gift that keeps on giving. Your kid’s imagination will surely go through the roof with the Anchors Away. 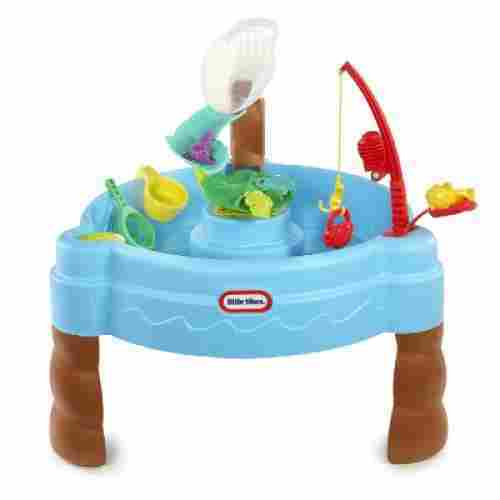 There’s just a lot of cranking and spinning and pretend play activities that can be enjoyed with this particular aquatic play set. 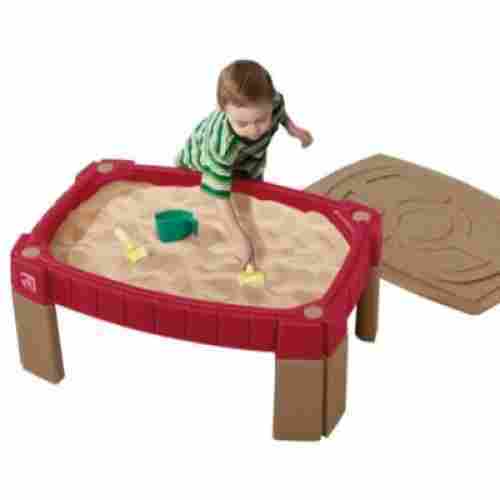 If you require a sand and water table that can be played with simultaneously by your kid and his or her playmates, then the Naturally Playful Sand and Water Center is the plaything to get. 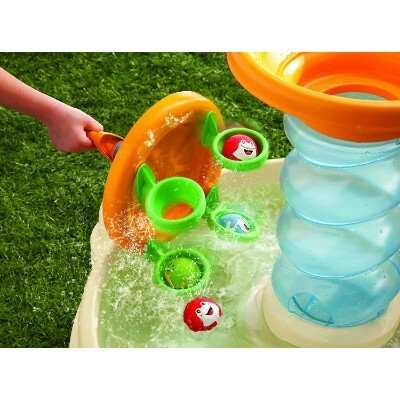 This outdoor water sand table has two separate compartments, one for liquid and the other one for sand. The water compartment has a molded elevated roadways with 2 bridges that connect to the sand compartment. Fill one compartment with liquid and pretend to navigate the 2 small boats under the bridge and around the “island”. This Sand and Water Center comes with a wood-designed lid complete with molded features. There are also roadways on the lid so kids can still play with the sand water table even if it is covered. Here’s the best part. 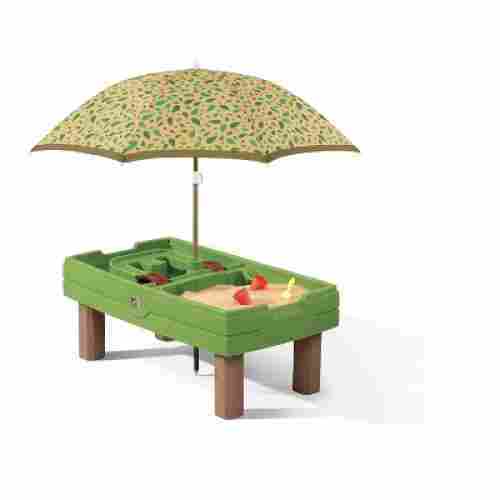 The Sand and Water Center comes with a beautiful umbrella that can be slotted into a hole in the middle of the table. At least, your kids can have a wonderful time playing in their sand and water table even under the scorching heat of the sun. The legs can be easily detached, too so storage should not be a problem. The Center’s lid can be secured with its elastic tie-down mechanism. This is the water table that give children the best of both worlds. Like being at the beach, we give you the sand AND the water! The two compartments connect through “waterways” that simulate boat navigating around the sandy islands. Two bridges connect the compartments. A wood designed lid also doubles as a roadway with it’s molded features. Even better, is the included umbrella canopy to keeps the kids cool under the sun. It’s ingenious to have 2 separate compartments in just a single platform. The addition of an umbrella and holder is also very thoughtful. Now, kids can really see their creativity as well as superb imagination be enhanced. 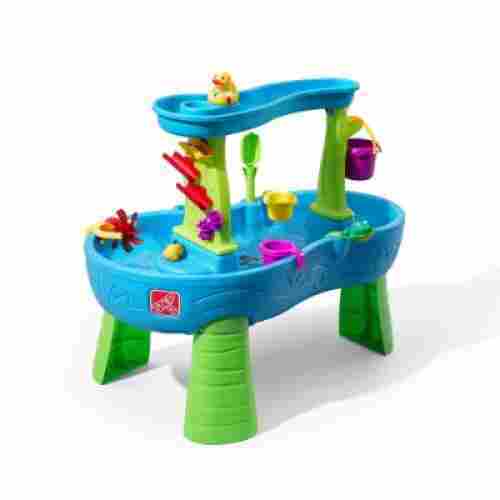 Similar to the Sand and Water Center is step2’s Cascading Cove Sand and Water Table. 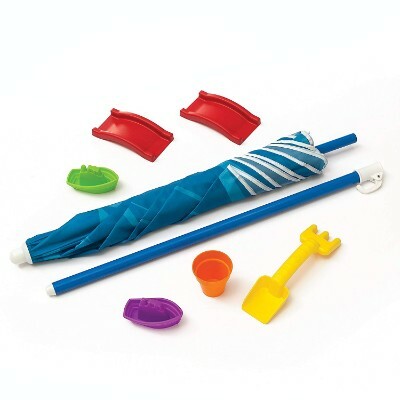 It comes with the same elastic tie-downs, molded-in roadways on its sturdy and ever-reliable lid, easily detachable legs, and an umbrella and umbrella holder. The only difference is the design of the table’s 2 compartments as well as the placement of the umbrella holder. The Cascading Cove is designed more like the natural arc of a natural beach cove. The liquid compartment also features an island that is connected to the “mainland” by two bridges. There’s also a drain plug in the water compartment which easily removes the fluid after playing. 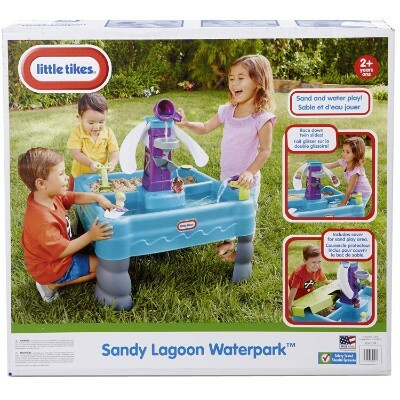 The Cascading Cove is perfect for those outdoor sand water table playtime activities. The lid can also serve as a separate playing surface as it has plenty of road surface for small toy vehicles. 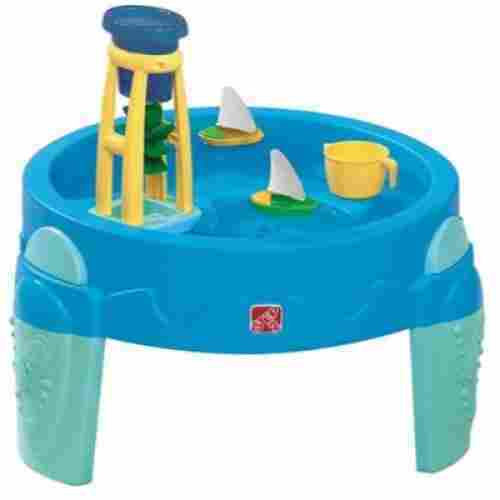 This is a perfectly beach-themed water table! The sloping edged design delivers more of the feel of interplay between water and sand. And the two bridged walkways emulate endless fun to be had on the boardwalk. For parents, the convenience of this item is undeniable! The detachable legs and drain play for the water compartment, allows for quick, easy, no-mess storage. The unique styling of the Cascading Cove can be a great instrument for your kid’s imaginative endeavors. If you’re going to choose between the Cascading Cove and the Sand and Water Center, we’d recommend the former. But of course, that would really depend on you. Talk about endless fun! It’s a good thing that summer days are always longer, because your kids will never want to come inside once they catch sight of this water and sand table. They can go from the ocean to the dessert with this all-inclusive table setup, and invite their friends to play while they’re at it. Each side come with its own toys; tiny sea diving action figures, and a pail and shovel for the sandy side. They can play separately or combine the two for beach-simulating, castle building madness! The best part is the cover that comes with it, just flip over and go -- perfect for protecting this table from the elements or just closing shop for the day. This table has something for everyone, and is great for group play. Each kid can have a side, and it’ll teach them the importance of sharing and taking turns while keeping them cool and entertained. This dual ended table is super cool just because it has the best of both worlds! If you can’t actually get your kids to the beach, you can get them this table as the next best thing and we’re sure they’ll be just as thrilled to create those sand castles. You can count on Little Tikes Fish and Splash to do more than just entertain; the adorable little sea buddies are all colored and numbered for young children still working on sorting skills and basic math. 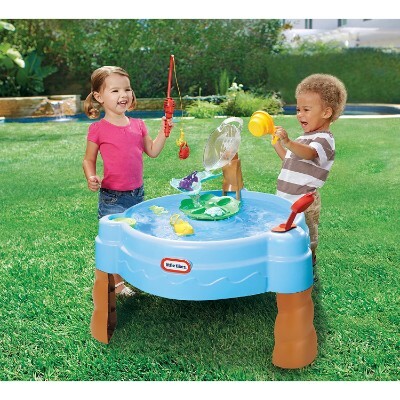 A fishing pole helps little ones catch (and count!) the five floating critters. Or, if they’d prefer, they can use the fishing net. 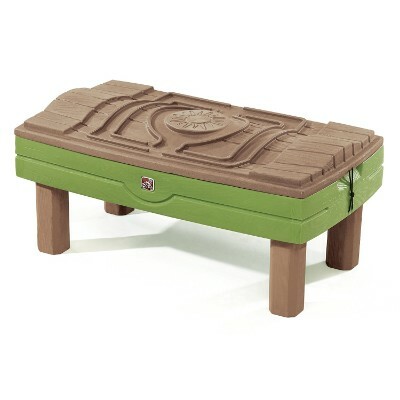 For added fun, they can launch their figurine friends into the spinning lily pad in the middle of the table. Filling the fishbowl eventually tips it over, pouring all the water down in a giant wave. A mini bucket with an extended handle makes it easy for kids to scoop water out and in. The table is durable and holds up to seven gallons of water. The turtle, crab, frog, and two colorful fish round out this awesome set, full of cool features and cool, educational fun. This water table not only has a plethora of interactive features but also actively works to help children develop academic skills. The little sea creatures are all color-coded and numbered, so kids can work on sorting and identification, as well as basic counting. It’s got a lot going for it. The launchpad, spinning lily, fishbowl, water slide, fishing net, and fishing pole all interact with the figurines, giving kids lots of room to play and explore. It’s easy to drain and easy to assemble, making it parent-friendly as well. Selecting a great outdoor water table for kids from a multitude of water and sand table ideas is very perplexing, to say the least. 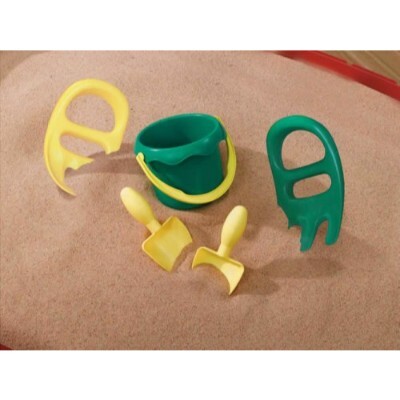 There are a lot of things that need to be considered and since there are literally hundreds of toymakers and manufacturers of juvenile products, it took us quite a while to come up with a sample that is very representative of what we believe are the best sand and water tables for toddlers and young children. We had to check the inherent features that the sand and water table manufacturer has built into the product itself. We had to make sure that these product features sit well with the developmental needs of the children that they are designed for. We had to determine if the company truly understands the developmental milestones of each age group of children and whether this understanding is reflected in the design of the aquatic table or not. Some companies are known for integrating a lot of features that do nothing to assist in the development of children’s skills. Clearly, we don’t want to give these products to our kids, do we? We also had to look at the safety and maintenance issues of these kinds of children’s playthings. Since we are talking about filling up a table with either sand or water or even both, then the table’s construction should be solid. It should be very tough and sturdy to support the weight of either water or sand or both. We also had to take into consideration other water toy items that may be added to the play area of the table. So, safe and durable construction is a must. The comments, reviews, and feedback of consumers, particularly parents, who have already used these kinds of playthings, were read over and over to identify the most striking theme of their experiences. We had our research team analyze these comments so we can have a better understanding of what they are really saying. We then added this understanding to our evaluation of the company’s reputation or overall credibility. We know you wouldn’t put your trust in a company with shady manufacturing practices either. And this is how we came up with our top 10 water tables for toddlers and young children. It’s tedious work but we did it anyway. What we want is to recreate the sense of safety and belonging for each child. In-utero is where we've all felt our safest--within our mother, floating, having all of our needs met simply from nature, our own bodies and the body of our mothers. Once taken out into the world, the possibilities are endless! But, there's always the desire to get back, which is the most vital for any developing child, the sense of nurturance. The closest thing in Mother Nature is the sea! It's inherent, and since many parents don't live near water, the water table attempts to bring the comfort of water and nature to the home! Part of our research was to understand the history of the water play table. You wouldn't believe some of the things we found...did you know that the water table is derived from the sandbox!? Parents of a certain age can definitely relate to this. Just a big rectangle full of sand in the park. You got your little toy bucket, then got transported. In fact, going back even further, the sandbox was a by-product of the German kindergarten that developed in 1847 by a student of Friedrich Froebel, founder of the kindergarten movement. One hundred and seventy years later, we're up and running beyond the simple rectangular space. We have the recreation of an actual beach, which enables the imagination to possibly move beyond our own contemporary standards. This is the ultimate goal for the development of the child, then as it is now! Water play is a great way to give a child a wonderful opportunity to develop both gross and fine motor skills. It is a way to fine tune those hand eye coordination skills and get those fine motor skills with the finger grip going. Water table are great for bringing together children of many age groups. Water play is something that most children at any age find entertaining. Water is a fantastic medium for fostering the optimum development of children. It can help in the enhancement of their coordination, strength, and balance, social and communication skills, and learning and exploration skills. That is why parents today are advised to provide their children with the opportunities to get really familiar with this liquid element from bath time to swimming or even playing with their very own water activity table. Toddlers, for instance, can benefit a lot from playing with water. First, being explorers, toddlers can discover a lot of things with liquid as the medium. They will be amazed at how some things can float while others sink to the bottom. While they may not fully understand the principles of hydrodynamics, they will know that heavy, solid objects will not float. A ship may be heavy but it has space inside making it lighter than the force of the liquid. Of course, they won’t understand yet how this actually works but they are already being introduced to such concepts. Young children also love to use all of their senses when exploring the world around them. Swimming or even soaking parts of their bodies in a liquid medium can stimulate every square inch of their skin. This can have a fantastic effect on their sensory processing. Water play also enhances children’s social skills and communication skills. They love to share with other kids what they have just learned or discovered playing with liquids. 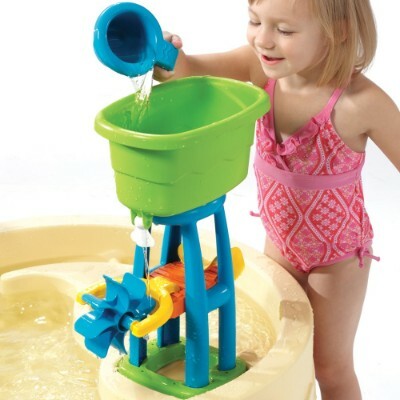 When they play with their water table toys, they learn to take turns cranking the waterwheel or even cooperate on pouring water in the funnel. When swimming, they can try to outdo one another which can also foster a sense of competitiveness in them at such a very young age. Swimming can also help provide motor skill, balance, and coordination enhancement. Pouring liquid on a funnel, for instance, requires the coordination between what their eyes see and the contraction of their hand muscles so that the water will empty right into the funnel. Playsets that have a variety of spinners and floaters will require excellent control of small muscle groups. Perhaps what is really beneficial from playing with water is the enrichment of children’s imaginative and creative abilities. They can recreate a severe storm in the ocean, tossing their small toy boats. They can imagine they are on a beach or even in a harbor so they have to know how to safely navigate the waterways and “park” their toy boat at the pier. They can also imagine being Olympic divers launching from a high diving platform. The possibilities are endless. And this is what makes water play truly useful in helping kids make full use of their imaginations. There are many other benefits of water play, often depending on the kind of water-related activity that children engage in. One thing is certain, water activity tables have a significant role in the overall development of today’s children. We wanted to stand by the quality of the product. This is why the research dove into the construction and reputation of the manufacturers. When it comes to something that deals with the logistics of having the right amount of liquid and/or earth, we had better be on our toes! We have also taken into consideration all of the possibilities that the product entail. We thought of the eventuality of playing outdoors on a sweltering day, so we gave the option of a table with an umbrella attachment. We considered the imaginative play and learning of a busy ball waterslide. The Arctic adventure that kids have become familiar with through Disney. We even made it no-mess clean up for parents with a convenient drain plug. Whatever we haven't thought of or considered will come to light with the support of parents and children who have found and will continue to find joy in these products. We've left nothing up to chance! q: How will a water table affect my child’s future development? It is proven that a child’s observation of water can aid in scientific understanding. Seeing the flow of water helps with an understanding of physics. Observing algae and plant life, or simply how plants grow when watered, builds a rudimentary knowledge of biology–even some chemistry. Mathematics comes into play when gauging the volume of water needed for the best experience with your water table. q: How will the water table improve my child’s social skills? 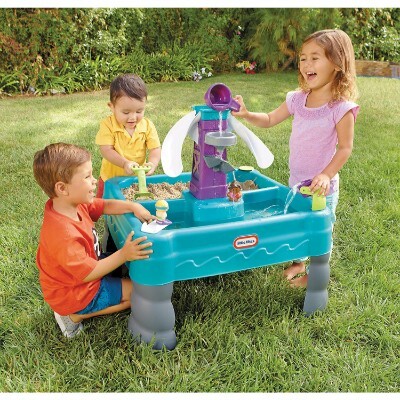 The water table encourages imaginative play with landscapes and sometimes figurines. A dialogue can be created that’s easily transferable to any other relevant social situation. There’s also the cooperative aspect when playing with other children. They can turn their play into a project, with the common goal of creating the dreamscape scenario of their desires. q: How versatile are water tables? You don’t have to just use the accessories provided with each water table! We encourage each individual child and parent to get as creative as they want to! Isn’t one bucket enough? Transform that old sippy-cup into a new bucket! Those toy boats aren’t enough? Let’s get the rubber ducky in the pool! q: How expensive are water tables? The average price ranges from $39.99 to $79.99 and above. q: Is a water table worth the investment? Let’s just put it this way, does the future of your child really have a cost that you’re willing to negotiate? Research has shown that the effectiveness of the water will pay dividends for years to come. It can be the equivalent of considering what might be the best kindergarten for your child. q: How utilitarian is the water table for parents? We’ve constructed our water tables in every way to make it both practically fun for kids and practical for adults! The lid that covers the table when not use, can double as a grooved roadway for toy cars and action figures. The sturdy legs that support the weight of your child and the water or sand, can also be easily detached for storage. The handy drain plug is air-tight and, but easily removable when playtime has ended.